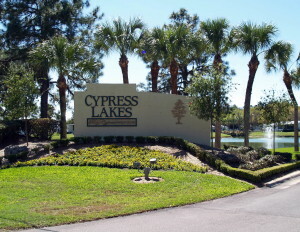 In Florida, you’ll find many 55 and older communities, but few can compare to the amazing amenities and idyllic location you’ll enjoy when you choose Cypress Lakes for your new home. We offer more than 1,000 acres of active retirement living that is the perfect combination of secluded tranquility and bustling activity, and you’ll always be within easy driving distance of some of the most popular attractions in the country. It’s no wonder so many retirees choose Cypress Park over other retirement communities in the state. We’re an especially popular choice for golfers, because at Cypress Lakes, we offer two professionally designed 18-hole golf courses, complete with a driving range, putting green, and full-time PGA pro available for lessons. The North Executive Course is a par-60 short course designed by renowned golf architect Chip Powell, while the South Championship Course is a longer Par 72 and has been acclaimed in such magazines as Golf Digest and Florida Golfer. Plus, once you leave the confines of our 55+ community, you’ll have year-round access to such popular tourist draws as the white-sand beaches of the Gulf Coast, the acclaimed theme parks of the Orlando area, and world-class entertainment venues throughout the region – to name just a few. To learn more about how Cypress Lakes stacks up against other 55 and older communities in Florida, or to schedule a tour to see our community for yourself, contact one of our friendly Lifestyle Consultants today.